- Make sure NSD service and Notes Single sign on services are stopped. - Rename npnotes.dll before the install. - Rename the npnotes.dll back to npnotes.dll. If you find this post useful, please leave me a comment or event better click on an AD! I had an 'Permission Denied' VB script issue last week. The script was trying to copy over an existing file in the windows installer directory. The problem only occurred when we ran the script through SCCM. Manually the script would work fine without issue. I figured out the problem with the assistance of Paul Chen (Sydney based app packager). 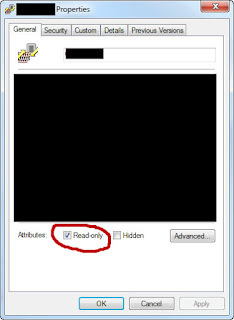 The issue turned out to be that if the file is set to 'read only' in windows you can't copy straight over the top of the file using VB script in an SCCM program. Delete the file before copying over the new file. 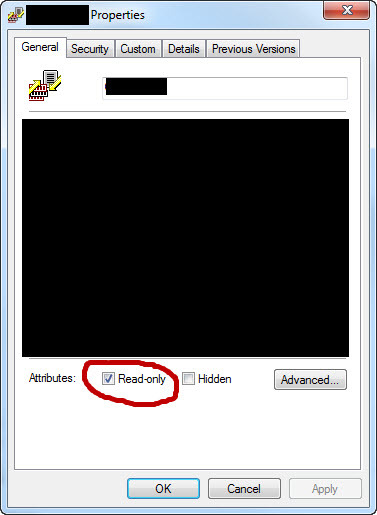 Remove the 'Read Only' checkbox from the file before overwriting the file. An per normal if you found this post useful leave me a comment or click on an AD. if you install office deployment toolkit for APP-V and then use an MST configure the proxies for it you won't be able to un-install it. the reason for this is when you uninstall the MST will try and re-activate the proxies. I had to make a fix for this that replaced the MST in the installer cache with one that worked to resolve the uninstall issue. Thanks J.C for this write up. - Please make 'A' the default play button in the video player instead of 'Y' I want to play the video instead of having to wait for the next menu load before playing the video. If I want to see more info about the video I can then press 'Y' for more info. - Instead of skipping 1/6 of the way through the video when I press the shoulder buttons only skip forwards 30 seconds and back 20 seconds respectively. - 'A' to pause and then 'A' to resume not menu. - Loading of menu's takes far too long.